Sneaker heads, do you have these cult favourites in your shoe collection? Sneakers are an absolute essential in any wardrobe – this year more so than ever. From athletic designs to fashionable slip ons to classic white kicks, every style maven worth their salt have been spotted rocking ’em all day err day. And according to Lyst, there’ve been way more online searches for sneakers than handbags in 2017, with over 3 million shopper searches per month on the site alone! Ahead, we share the top 10 most sought after sneakers of the year. 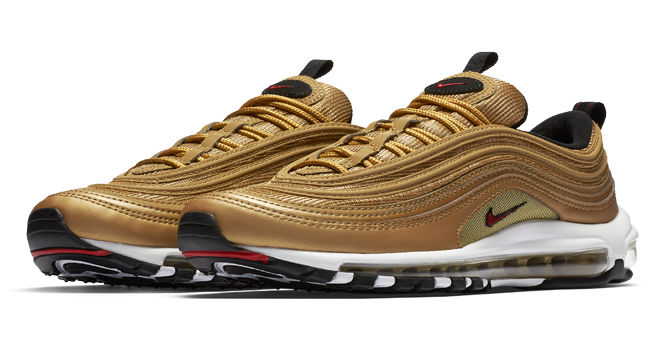 Brought back to the forefront of fashion by collabs with British-Nigerian artist Skepta, and OFF-WHITE brand founder, Virgil Abloh, Nike Air Max 97 truly embody the street spirit of the ’90s. 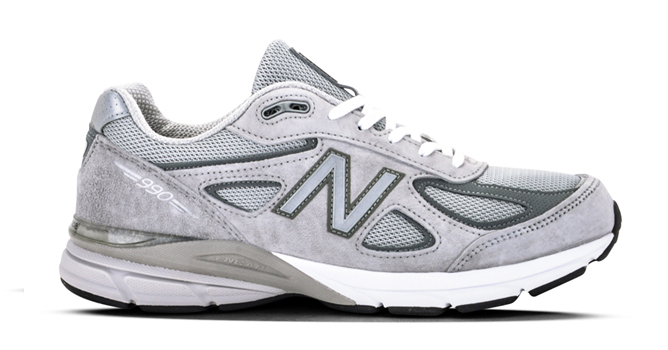 First released in 1982, the New Balance 990 released its fourth iteration back in May 2017 – it averaged over 10,000 searches per week. 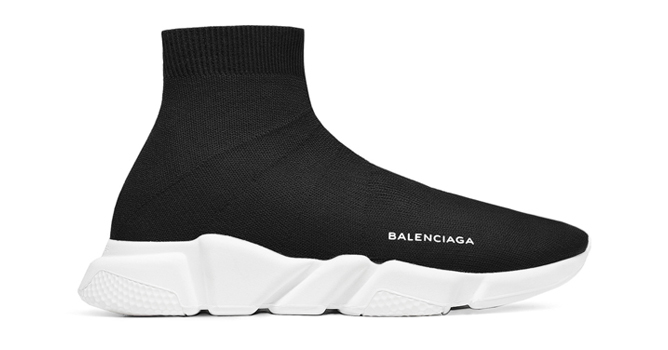 Spotted on many celebrities and Instagram style influencers alike, the Balenciaga Race Runners are right on the Dad sneakers trend. 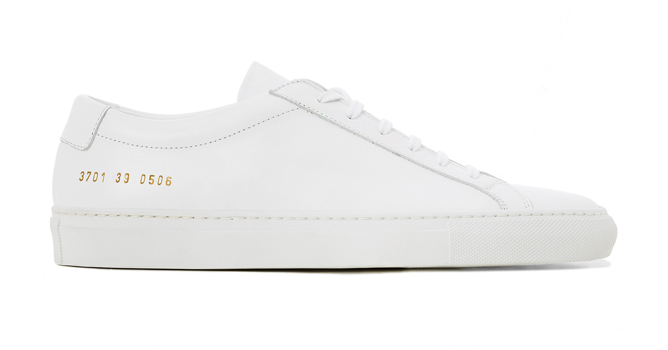 Gaining cult status for their ultra minimalistic design, this unisex pair of sneakers saw thousands of searches on Lyst. 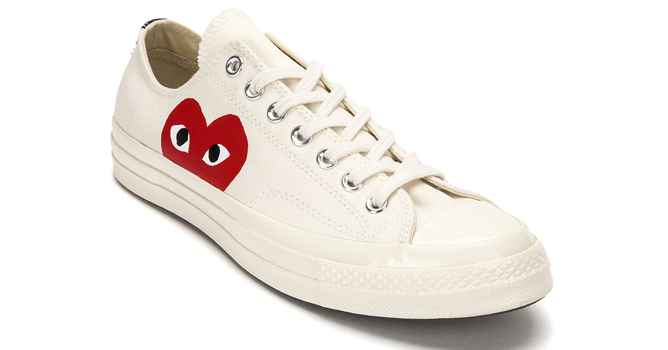 CDG Play sneakers were searched for over 10,000 times in January alone. We totally heart the fashion house’s COMME des GARÇONS PLAY x Converse Chuck Taylor All Star ‘70 collabs! 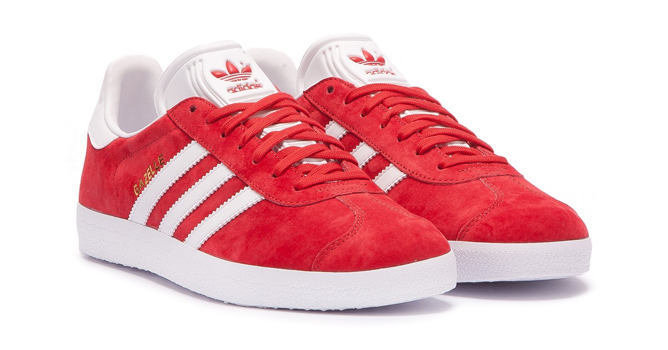 A refreshed version of adidas’ training shoe from 1991, this iconic sneaker boasts a sleek silhouette that retains all of adidas’ signatures, including their contrasting three-stripe heel tab. 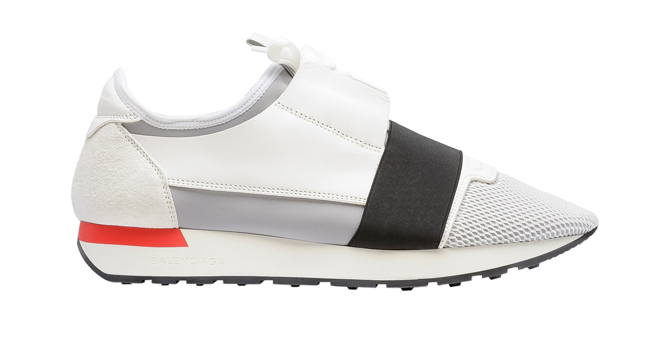 It currently sits as adidas’ most searched for sneaker on Lyst. Arguably the sneaker that made the biggest comeback, it seemed like everyone sported this skate shoe classic, from the likes of Gigi Hadid, to local style influencers, to your next door neighbour. 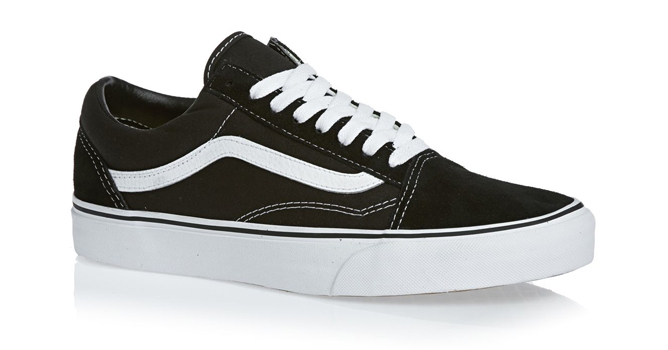 According to Lyst, searches for the Vans Old Skool increased in March, and were up by 48% in July 2017. 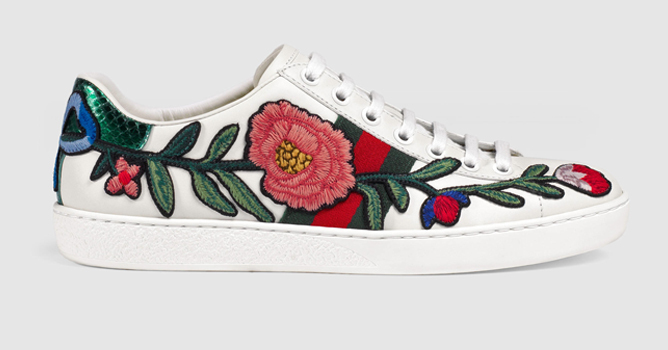 Gucci’s highly raved about sneakers made an even bigger splash this year with a bevy of customisable elements for wearers to express their every personality. A slip on shoe that looks more like a thick sock with a rubber sole, this bizarre trend took off and never looked back, as evidenced by Lyft’s searches. Sitting atop this list as the most coveted pair of sneakers in 2017, everything that Queen RiRi touches turns to gold! 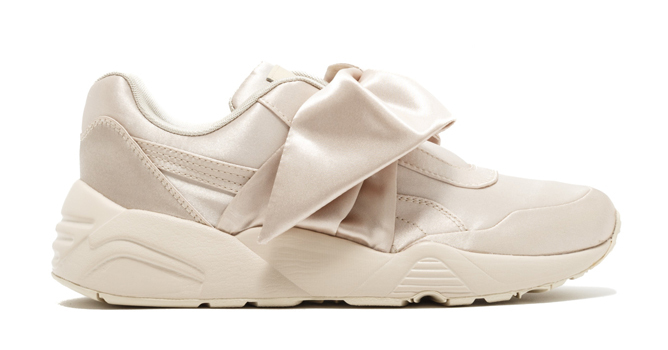 These fashion-forward pair of FENTY sneakers have a delicate silk bow that quite literally ties in any outfit – should we even be surprised that there was one search every seven seconds back in March 2017? Do you agree with this list? Sound off in the comment section below! Shield your peepers from the sun while looking super stylish at it, with these sunnies that’ll look flattering on any mug without breaking the bank. Scroll through the gallery to check out our top picks! Which shades will you be rocking? Tell us your picks in the comment section! Save Major Bucks On These Black Friday And Cyber Monday Sales! The avalanche of sales isn’t over yet! With Black Friday and Cyber Monday set to take over our weekends, here are the best deals to shop to your heart’s content. Yet another perfect opportunity to snag your favourite makeup products at discounted prices, Sephora Singapore’s Black Friday sales sees a one day only 15% discount site/storewide. While it isn’t as enticing as the crazy blowout sales Sephora international has, we wouldn’t pass up a chance at cheaper makeup prices. Lazada is a strong contender when it comes to sales and Black Friday isn’t an exception. This weekend, shoppers can expect up to 80% off, over 50 flash deals and more than 1 million Black Friday Weekend deals! And the best part is that Lazada hosts an extensive catalogue of brands, which means you’ll definitely be able to pick out something you want. 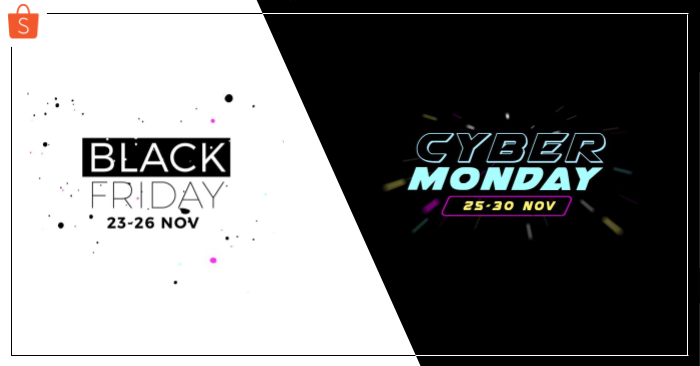 Additionally, their Cyber Monday sales will let you take advantage of the massive sales to cherry pick the best of their IT sale items, from computers to mobiles, tablets and other tech gear. Thinking of shopping from sites like ASOS, ShopBop, Sephora, Lazada and more? Use ShopBack to get even more savings while you shop! The platform is offering up to 80% off and up to 30% cashback off your purchases, so there’s really no reason to skip out. 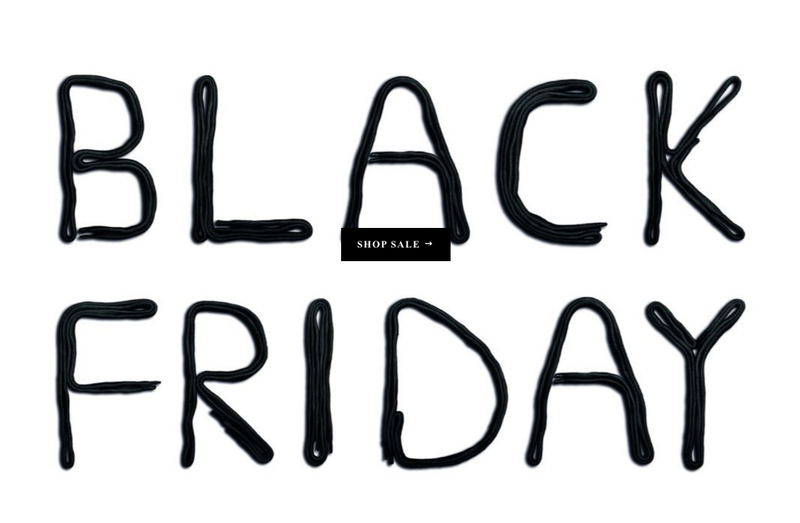 WWhen it comes to Black Friday sales, this online behemoth is impossible to beat. A casual browse thrbough the Amazon site has us gagging at their ‘Deals of the Day’ where they offer up to over 70% off on selected items. Our local Amazon Prime app also offers great Black Friday sales, so remember to check it out too! EZBuy may be the most popular with Taobao shoppers, but don’t neglect the other beauty, lifestyle and fashion brands they carry too. This year, they’re offering free agent fees across the weekend, with up to 90% off and 15% off on shipping from US and Korean brands. From now till 26 November, Watsons is slashing their prices and giving 20% off site wide, plus an additional $15 Watsons eVoucher (with min. $80 nett spending) for those with the POSB Everyday Card. And we hear they have a Cyber Monday surprise up their sleeves, so keep an eye out! Get your fill on tech, beauty and fashion during Shopee’s massive Black Friday and Cyber Monday sales. There’ll be up to 80% off this weekend on beauty, fashion and home and living products, but for those who’re camping out for gadgets, wait till Monday to get the cheapest prices on all things tech! And the iPhone X will be on sale for only $1,599 – all of Shopee’s products are marked with their ‘Lowest Price Guaranteed’ label, which means that Shopee promises to refund buyers twice the difference if you find the same item selling for less elsewhere online. Joining in the Black Friday/ Cyber Monday festivities, online beauty retailer Beauty Carousel will be holding a 20% storewide discount for beauty brands like K-Palette, beautyblender, Klara and more, while their Cyber Monday sales will feature up to 50% storewide discounts from 26 to 28 November. With massive sales running from now till 27 November, there’s no better time to snag yourself a stylish pair of sneakers! You can expect up to 80% discounts off Superga shoes, with prices starting at $30. Shopaholics rejoice! 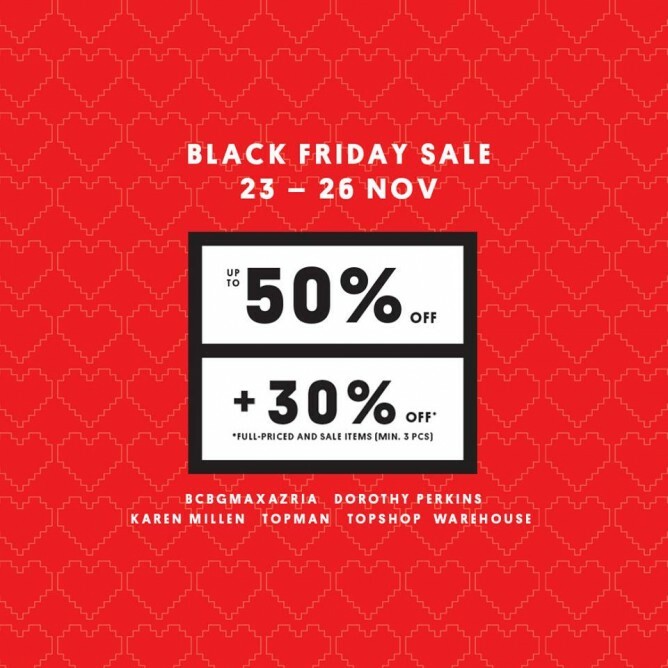 From now till 26 November, take up to 50% off when you shop at wt+ brands: Topshop, Topman, Warehouse, Karen Millen BCBGMaxzaria and Dorothy Perkins. And, wt+ members and DBS cardmembers can get an additional 30% off your total bill when you purchase a minimum of three items. One of the top sites to check out for awesome discount codes, Couponation is offering Black Friday and Cyber Monday codes that’ll knock off extra bucks off your bill. Think Sephora, ZALORA, Under Armour and more! What’s on your shopping list? Share it with us in the comment section! Don’t let the crushing workload that comes with being a student on assignment deadlines squash your swag. The next time you’re thinking of rolling up to lectures clad in your most presentable sleepwear, take some inspiration from these jet-setting celebs and recreate their killer off-duty styles. A baggy muscle tank and ripped jeans would be considered dressed down were it not for the spicy pop of reds from Zendaya’s top and platform heels. If rocking sky high pumps aren’t your thing, swop ’em out for a pair of classic sneakers, making sure to accessorise with a statement necklace for an extra oomph. Rihanna pairs a slouchy hoodie with a structured outerwear (worn off-shoulder of course) to add a hint of shape to her outfit. She keeps it simple by accessorising with high socks and white strappy sneakers. Reaching for solid coloured pieces are way easier for lazy days with no time to fret over your outfit. Gigi Hadid pairs her all-black jeans and T-shirt combo with subtle metallic accessories to create a classy look with minimal effort. For a complete ‘dressed down yet chic’ look, slip on a comfortable pair of sneakers. Plain T-shirts can hold any casual outfit together, and they’re also the best to grab if you’re running late. Upgrade your t shirts with fun prints like IU did with cactus graphics so you can still look fashionably cute even on those hasty days. We’re all familiar with the typical sleeveless tops and denim shorts that most teenagers reach for, but this dressed down look doesn’t have to be boring. Be strategic with your accessories – Cara wore chunky high cut Nike’s and a bright red beanie that injects her fun personality and draws attention away from the standard outfit. Dress down days are synonymous with jeans – you can even pull off a sophisticated look with the right cuts! Selena Gomez looks extra leggy with bootcut denim jeans and platforms that elevate an otherwise basic pullover. Pull your hair back into a ponytail to save time on styling your mane and let a pair of glam hoop earrings do their thing. Lee Sung-Kyung layers on a long wooly sweater over a white crew neck and black denim shorts, instantly turning a beach-day outfit to a getup that’s good for hitting the town. Even Miranda Kerr knows the magic of throwing a blazer over a casual outfit. The fashion classic doesn’t have to be a skin tight situation. For those lazy days, a black loose-fitted T-shirt dress or a skater dress will go with any accessory and shoes – don’t have to worry about mismatched tops and bottoms, the LBD makes those ‘I just rolled out of bed’ days so much simpler. What are some of your favourite lazy day outfits? Sneakers are a staple in everyone’s shoe closet and it ain’t surprising; they’re comfortable, functional and perfect for a day of running errands without having your feet scream in pain. The athleisure trend has no plans of slowing down and neither do the sneakers.